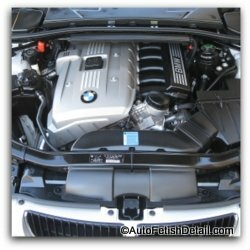 "As owner of Auto Fetish Detail I have learned much in the course of my 30+ year career as a professional detailer here in Orange County, CA. In a world of ever-increasing technology, I still prefer the direct, candid, and honest approach in answering your questions and operating business. While I have taken great lengths to provide more than enough information so that you can make an informed decision, I still welcome a direct phone call to answer any of your questions that may still arise. My direct phone number is located on every page in both the header and footer. Thank you and I look forward to hearing from you!" The truth is that every car is truly unique and a "one size fits all" approach to detailing is unrealistic. The reality is that a seasoned professional like myself could literally spend an entire week detailing your car to complete perfection. This is both unrealistic and inappropriate for virtually everyone and every car. 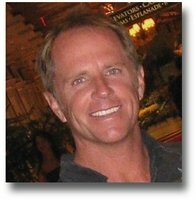 I have found that the Gold service is both the appropriate and realistic approach for 98% of all my customers. If you accept the fact that not only is every car different in size, color, and condition, then you can understand how detailing is truly not a "one size fits all" kind of moment. Experience has taught me that every person comes to the table with very different understanding of what detailing is and what it entails. For some people, it is more like a glorified wash and wax. For others, it means restoring a car to mint condition regardless of time and effort required to do so. Degrease and dress wheel wells. Clean/degrease door jambs, door sills, etc. Complete detailing of rocker panels from all road grime. Meticulously clean, shampoo, and detail all interior materials and surfaces including but not limited to: floor mats, carpeting, seating, door panels, cubby-holes, dash gauges, vents, etc., etc. Heavy duty cleaning of all interior leather. Darren's Note: The critical part of my car detailing prices is that I give a starting point. The obvious reason is that not all cars are created equal just as not all cars are equally dirty. I have an exceptionally critical eye, trained to dissect the tiniest of nuances and find that most people don't require that level of service in which most people lack the ability to discern the difference. This is a kind way of saying that "if you can't appreciate, understand, or see it, then why pay for it". Also the packages above will accommodate 98% of my customer base with the last 2% being unique individuals with a hyper-critical eye who truly demand and can appreciate the endless nuances and details that most people would glaze over. I am a flexible individual and understand that ultimately I not only work for you, but it is your world, your money, and your car. When I show up for our scheduled detail appointment I will spend the initial first few minutes to look over and discuss any specific concerns you may have and assess your top priorities along with your specific budget. With every car there are always areas or ways in which to save some time and money if you as the car owner are not overly concerned with these areas; a trunk is one such example. And as a person, you may simply prefer to stick to an exact budget and allow me to deliver the best service based on your budget and particular areas of concern. As a rule, I operate though it is my car and my money being spent, and deliver service accordingly. Once again, I always perform with the goal to develop long term relationships and over-delivering has always proven to be effective strategy for this. If your car is 5 years and older. Want to maximize your spending dollar with Auto Fetish? ; have your car washed a day or two prior to our appointment time. Yes you read that correctly! This way you pay us to do what we do best and that is professional detailing, not car washing. The reality is that any detail job will require any superficial dirt to be removed or washed prior to any real detail work can be performed. This is not required, just a suggestion if you like to get the most out of your money with our services. Most people appreciate the concern we take in advising you on how to get the most for your money; one of many ways we strive to ever-increase the value we deliver as a company!. Just What is Auto Detailing? Visit our Frequently Asked Questions for a more comprehensive list of commonly asked questions to become even further informed. First Timers: If you are new to the world of auto detailing, you may be asking yourself just what is auto detailing? Detailing in a simplified explanation is the art and science of putting your car back into showroom condition; you know, just like the day you bought it brand new! ( or better than the day you bought it if you happen to have bought a previously owned car) This involves polishing, waxing, shampooing, vacuuming, cleaning, scrubbing, etc., etc. What ever it takes to restore your car back to that show-room like condition. If your car is considered dirty, (your wife/husband thinks it's dirty, your neighbor thinks it's dirty, everyone agrees it is dirty, and you have suddenly come to the awareness yourself that indeed your car is dirty), then imagine it extremely clean; just like the day you bought it brand new kind of clean! From making your paint feel silky smooth and shiny, to everything in your cars interior being cleaned and detailed; seating, carpeting, floor mats, threshold plates, vents, gauges, dash, cubby holes, etc., etc. You get the point; your car looks showroom fresh once again. While we offer different levels of car detailing prices, the reality is that not all cars are created equal and not all cars are equally dirty. With that said, we always strive to over-deliver. But we cannot over-deliver on unrealistic expectations. Part of my professional service is to manage peoples' expectations. If your car is what is considered excessively dirty, we can still maintain the pricing schedule from above, but will have the ability to pick and choose as to what will make the most impact based on you, your expectations, priorities, and budget. For this reason I ask numerous questions when scheduling appointments and this helps me assess you and your expectations. How old is your car and how many miles are on it? The older/more miles on it the more likely it is to lean towards the dirty side of clean. Have you ever had, or when was the last detail job performed on your car? 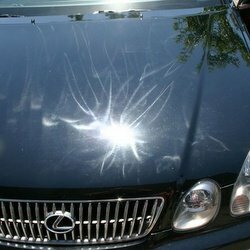 Does your paint have visible problems that concern you such as scratches, swirl marks, spider-webbing, etc. Do you allow pets in your car and have pet hair through-out your car? Any significant liquid spills or stains in your car's interior? Any of the above listed conditions or variables may or may not effect the final price of your detail service. Once again for these reasons I ask initial questions on the phone when scheduling appointments. I am simply trying to assess your particular situation so together we can conclude the most appropriate service for you and your world. Wow, my car looks amazing! My car didn't look this good the day I bought it. I didn't realize my car was so dirty. This is the best money I have spent in a long time! See the below sections regarding additional services that may be a different area of car detailing in general, or are what is considered add on's to the above car detailing prices. As a rule, an additional charge of $35-$50 to degrease/detail your engine in addition to the quoted car detailing prices from above. But just like car detailing in general, numerous factors should be taken into consideration when assessing whether you want your car engine detailed. I can do a quick degreasing and call it quits, or I can spend the time to detail the underside of the hood and meticulously detail not only the engine itself, but the surrounding bay area. You can go to engine bay detailing to see the full page. It's a jungle out on the roads here in southern California and no where does this show more than the front end of your car. With strategic use of custom mixed car touch-up paint, the front end as well as your entire car can be touched-up so these annoying marks will become virtually undetectable when viewing from normal viewing distances. Not to be confused with traditional factory car touch-up paint that creates that unwanted bird-dropping effect, today's car touch-up paint methods are far superior. Paint correction is simply the process of improving the condition and appearance of your cars paint through the use of various polishes, polish pads, and buffers. While many horror stories of car buffers spread from one ignorant person to another, the truth is that paint correction should be left to professionals with years of experience. It is not car buffers that damage car paint, but the person behind the buffer. Anyone who insists they only do car polishing by hand is either ignorant or unskilled; and probably both. Most of you reading this will require no additional paint correction services and the "Gold Service Detail Package" will work for most of you reading this. If you are currently un-happy with the overall look of your car paint, paint correction services is the only way to permanently change the overall beauty and appearance of your cars paint. Yes, decontaminating and waxing the paint will absolutely enhance the beauty and appearance of your paint, but it will not remove the micro-scratching, spider-webbing, swirl marks, holograms, etc., etc. For those of you with a critical eye, we can raise the level of your paint to any level of perfection you require. Regardless of the reason, we can improve the visual perfection of your car's paint through skilled use of polishing techniques. The picture at the bottom is an example of what is referred to as swirl marks, buffer tracks, or holograms. These are created through improper use of high-speed car polishers and ironically enough, can only be truly removed through the use of proper car buffer techniques. Maintenance detailing is different than traditional auto detailing services and will have different pricing from the car detailing prices found here. This service leaves your car in showroom condition every time I come and perform my professional detailing magic. If you are looking to maintain your car in showroom shape, maintenance programs are the way to go. Prices vary based on the exact car type, and frequency of visits. There is no set rule here as every person is different. Once again there is no set rule. It is all based on you and your world. For a more comprehensive description of boat detailing prices, please go to Boat Detailing of Orange County. If it makes you feel better, I use only the most expensive, and most durable, marine grade sealant on boats. The industry is full of hype and misrepresentation and for this reason, I simply add this description for anyone that needs a little extra confidence based on the endless marketing and advertising that does as much disservice to the industry as it does good. 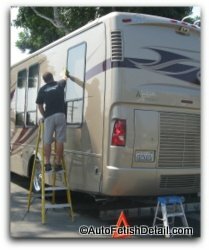 For a more comprehensive description of RV detailing, please go to RV Detailing of Orange County. Prices are based on condition and services wanted. Smart people always read the fine print of car detailing prices. If you really are among the smart people as I know you are, then click on the link to take you to the fine print of my car detailing prices. If you really like to cut to the chase, I say just call! I promise to answer any of your questions in a candid and honest way and help you decide the best decision for you and your world. I promise I am both friendly and polite!